The title of this exhibition in Montelabbate (Italy) dedicated to the artist Anselmo Bucci lands us in the middle of that important chapter to dedicate to visual artists and their experience of the Great War: "L’arte in trincea. Anselmo Bucci e la Prima Guerra Mondiale" is a very short exhibition starting on the 2nd of June. The show gather fifty drypoint etching artworks from the folder Croquis du front italien (Paris, 1917) where we find the results of his war experience at the front as volunteer cyclist. 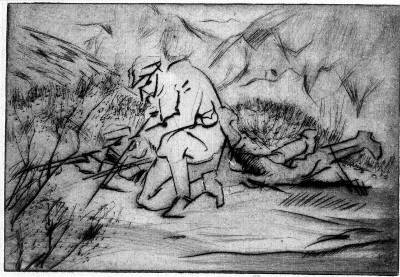 In spite of his affinity to futurist artists such as Marinetti, Boccioni and Sant’Elia, in the etching works here displayed we discover Bucci's eye more absorbed by the rest moments of the battalion. One of the reasons of interest of this exhibition is also the background and overall frame where the artworks lay, full of cross-references to the main Italian writers operating during the First World War years. By the way, Anselmo Bucci was a writer himself. In 1930 he published Il pittore volante ("The Flying Painter") awarded with the prestigious Viareggio literary prize and some aphorisms of this lucky book gained popularity in Italy.